I’ve been neglecting nature in the past few posts, focusing on in-depth (and probably quite dull-looking) reviews of pseudoscientific treatments. Here, I’m going to show some pretty (I think, anyway) photos of some bugs! In a post on the differences between dragonflies and damselflies, I included a couple of photographs that I took while identifying invertebrates from some field samples that I took earlier this year. The project is looking at the biodiversity of stormwater management facilities (SMFs) in Ottawa, Canada. I wasn’t expecting to find much, as these kinds of ponds and small lakes tend to be fairly small, unimpressive and dirty. However, I was pleasantly surprised! Mayflies are an interesting group to find in these ponds. They tend to be relatively sensitive to environmental pollution (which these ponds are full of, draining built-up areas) so it is a good thing that they are present. They occupy a range of roles in the aquatic environment, largely feeding on algae by scraping it from the surface of rocks. 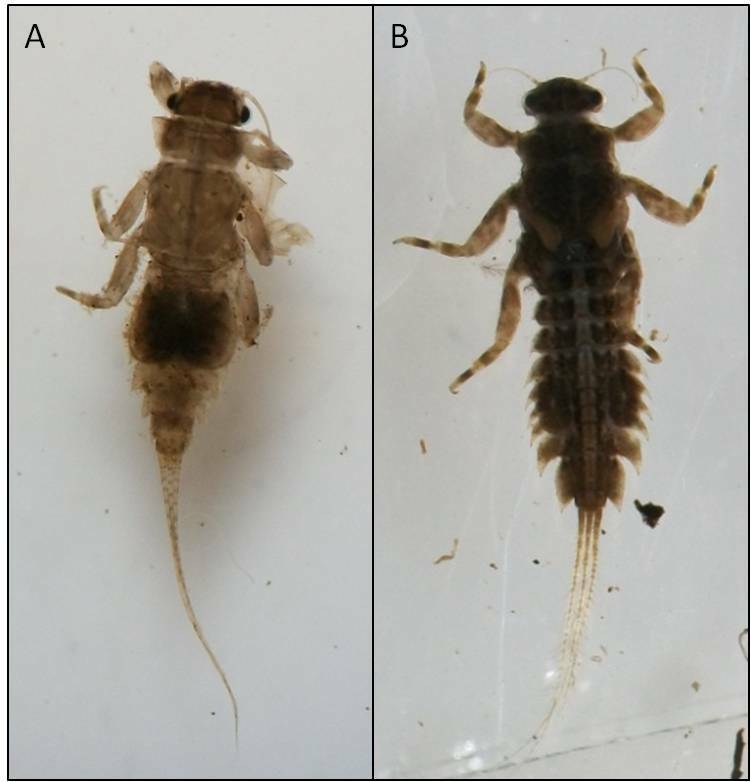 Two different families of mayfly: (A) Caenidae, and (B) Baetiscidae. When the layperson talks about bugs, they tend to mean any insect. However, the “true bugs” are those insects found within the order Hemiptera. They mostly have piercing, tube-like mouthparts which they use to feed on plants, but some are predatory (like these guys below) and other are parasitic. The parasites include the reduviid bugs that transmit trypanosomiasis (sleeping sickness or Chagas disease) in South America. 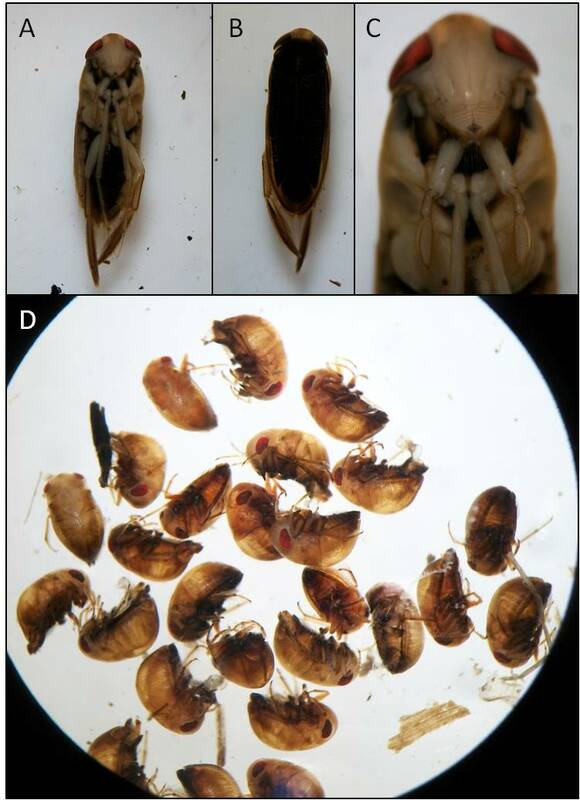 (A) Ventral, (B) dorsal and (C) close-up views of a corixid bug, otherwise known as a waterboatman. 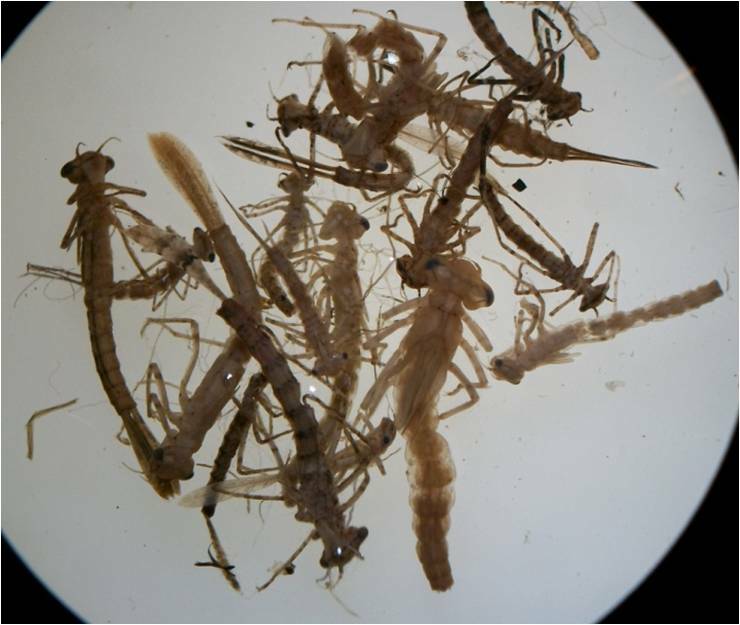 (D) Lots of Pleidae, pygmy waterboatmen. I’ve covered the odonates elsewhere, but they are all predators and can be the cornerstone of ecological communities in small or temporary ponds. This is especially the case where fish are absent. As with the mayflies, they are very sensitive to pollution so it has been extremely satisfying to find them in these ponds. The Crustacea are another important aquatic and marine group. 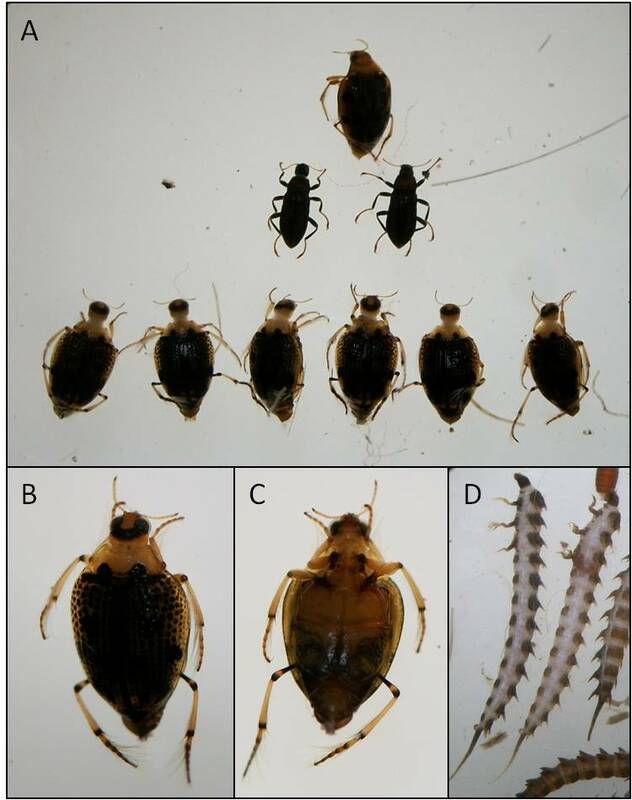 The common species found in my surveys fall into two groups: the Isopoda (“iso”=”same”, “poda”=”foot”, because the legs are the same length on all segments) and the Amphipoda (“amphi”=”different”, “poda”=”foot”, because the legs are of different lengths). I’ve given examples below. These can be extremely common, especially where there is a lot of emergent vegetation, which they consume by “shredding” it. Their messy eating habits provide a lot of additional suspended plant matter which supports animals that filter those particles from the water. 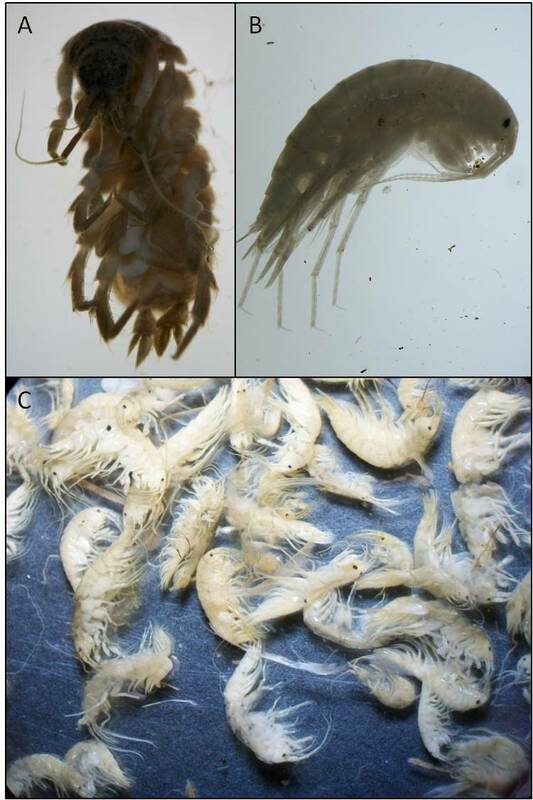 (A) An isopod in the genus Asellus, (B) an amphipod in the family Crangonyctidae, and (C) an illustration of crangonyctid abundance. The caddisflies are a little-known group of winged insects whose larvae live mostly in running waters. Fly fishermen often make their artificial lures in the image of these creatures. The larvae occupy a variety of roles, including predators, filter feeders and grazers on plants. They are interesting because they, like the moths and butterflies, can spin silk which some species use to form cases and others use to create nets to catch particles of food as they float by on the current. Others build cases from twigs or stones to use as defense against predators. 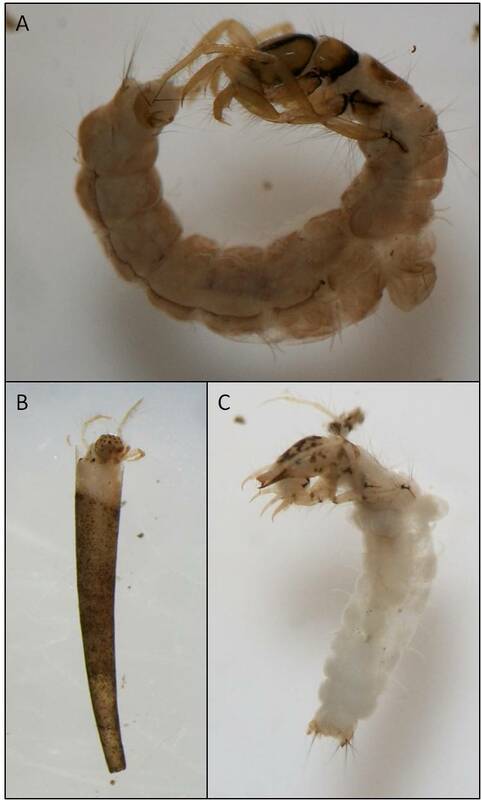 (A) A caseless caddisfly, (B) a cased caddisfly larva in its case and (C) the same species out of its case. It is a tradition in first-year undergraduate biology courses to introduce the beetles with the following (probably apocryphal) quotation from JBS Haldane: when asked by a bishop what he was able to infer about the mind of the Creator from his studies of the Creation, Haldane said “He had an inordinate fondness for beetles”. The beetles are without doubt the most diverse order of insects and occupy virtually every niche. What most people don’t know is that their larvae do not look much like beetles at all. They are closer to grubs or maggots in most cases, although the examples that I have shown below look more characteristic of the larvae of mayflies and odonates. Spiders and mites are closely-related groups within the Arachnidae. 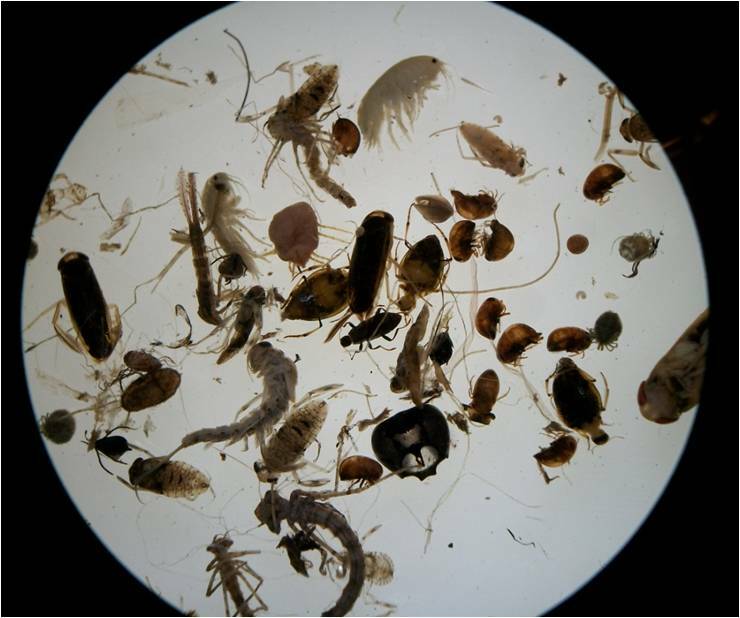 The aquatic examples that I have been finding are all predators or parasites, mostly feeding on other invertebrates. 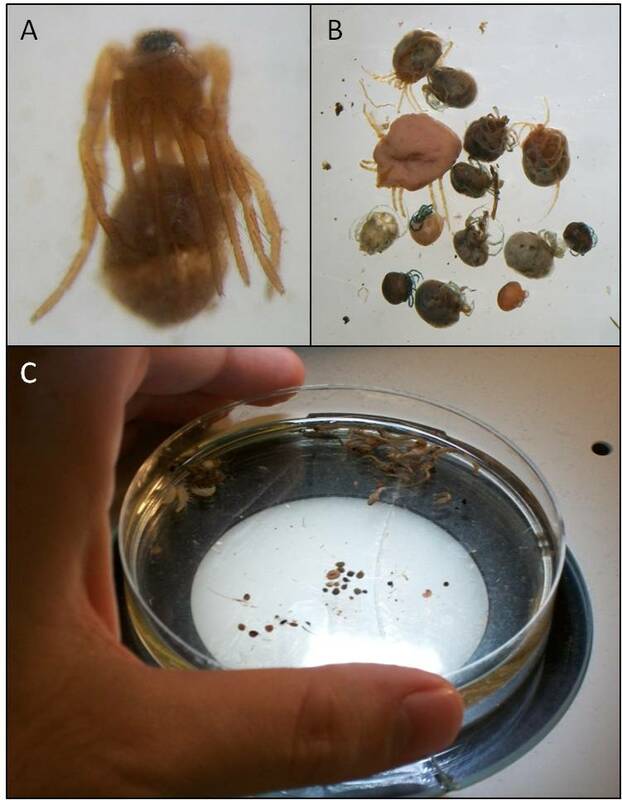 The larvae of some of the mites shown below are probably parasites of adult insects (including the odonates), but my mite identification isn’t good enough to tell you which ones. To illustrate the scale of these critters, I’ve shown the petri dish within which all the specimens were contained in the final photo. See, nothing to be afraid of! (A) An aquatic spider (I'm not sure what species), (B) a variety of mites, which are very difficult to identify, and (C) an illustration of the scale of these guys!